Can you believe I’m sharing my first gift guide of the year?! I thought there would be no better place to start than with a hostess gift ideas. With Thanksgiving dinners/parties coming up soon and holiday parties not long after that, this is the perfect time to be thinking about or stocking up on gifts for the lovely hostesses in your life. 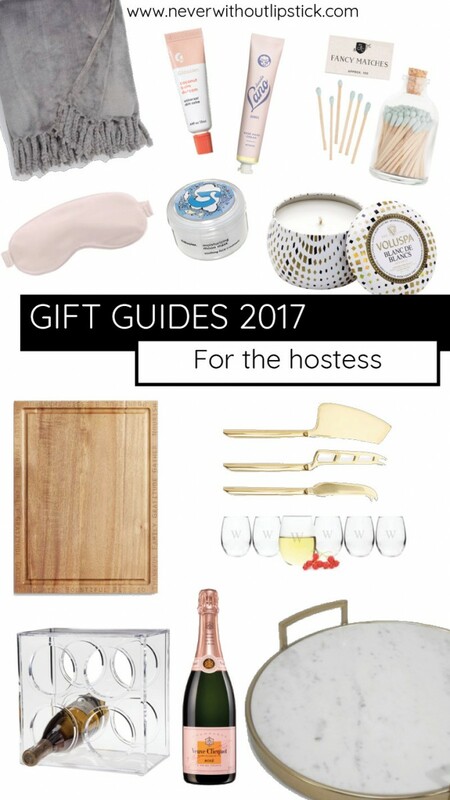 Below are some of my favorite hostess gift ideas! I think it’s best to go with a bit of a theme for your gift or give items that she can use all together. Beyond the candle: I know people joke, but I really do love to receive a candle! But if you want to go beyond just the candle, why not give her a cute decorative set of matches to go with it? Pampering package: I tried to keep all of these gift ideas under $40; a great way to save money if you’re heading to a lot of parties is to whip up a pampering package for your hostess. You can guarantee that your hostess has been hustling to get her space ready for her party, so why not give her everything she needs for an at-home spa treatment. Think hand cream, lip balm, and some face masks! And don’t forget that Black Friday 2017 and Cyber Week 2017 are fast approaching – bookmark this page for all things steals and deals. Looking for more hostess gifts? Head here. Need gift ideas for the gals in your life? Here’s your next stop. Loving this hostess gift ideas feature? Take a look here for more of my gift guide favorites!